The focus of my research changed suddenly, from the British Bronze Age to the Neolithic, one day in the summer of 1997. 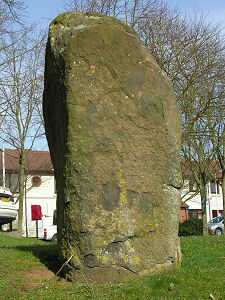 I was reading an excavation report about the prehistoric ceremonial site in Scotland, known as Balfarg. It was a large and complex place. As well as a neolithic henge and stone circle, which was preceded by a timber circle, there were the remains of mysterious rectangular timber built structures. There was also a ring cairn and a ring ditch. Lots of prehistoric pottery was found, ranging from neolithic bowls and large grooved ware bucket shaped pots to bronze age beakers, tripartite food vessels and bucket urns. Pits contained what the excavators interpreted as "ritually charged" material. These so called "ritual pits" contained large quantities of broken and burnt pottery, mixed up with charcoal and burnt bone. Apparently, these things were deposited deliberately. In other pits there was no pottery, just charcoal, and the pit had been carefully sealed with closely packed stones. Residues were noticed on a few sherds of neolithic grooved ware that had been buried in one of these pits. Analysis of these cereal based residues with meadowsweet pollen are similar to those found on Bronze Age pots, specifically, the Strathallan Food Vessel and the Ashgrove Beaker, which have both been interpreted as possibly being the remains of ale. 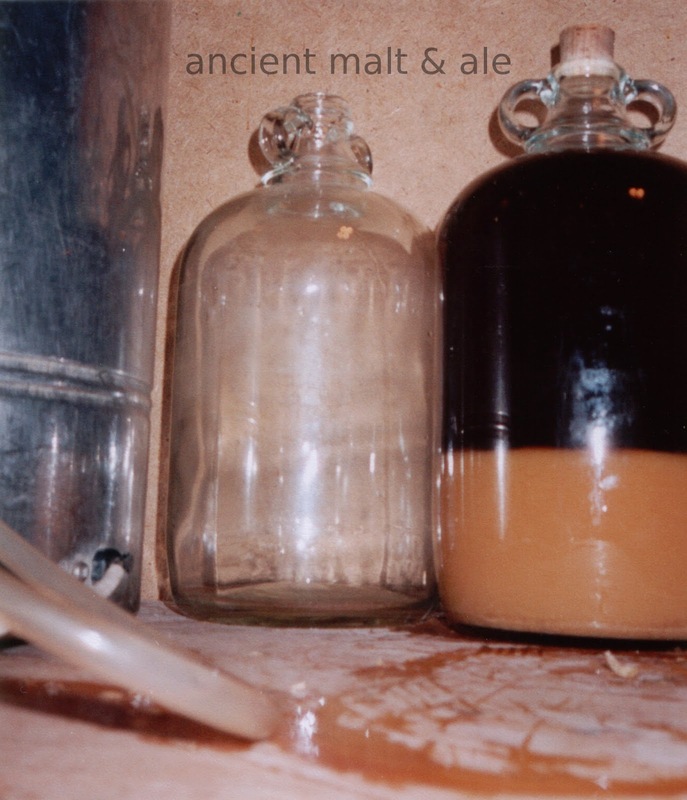 Were they making malt and ale in neolithic Britain? It seemed so to me. The Neolithic Revolution began in the British Isles around 4000 BC. Did it take people almost 2000 years, until the Bronze Age, before they realised or discovered that it was possible to make malt and ale with the barley and wheat that they were so keen to grow? Was the Neolithic really a time of growing grain to make flour, bread, porridge and gruel? Or were they making sandwiches for the feasts, as Professor Mike Parker Pearson seems to be suggesting. Or maybe he is just making a joke? When making ale from crushed malted grain, two types of sludgy cereal based residues are generated during the brewing process. The first is a sludge, rich in barley chaff from the sparging process. Freshly sparged wort is cloudy at first. Once you have a clear wort, it is racked or syphoned off into a fresh clean vessel. Some chaff will inevitably get through. Boil the wort with selected herbs, flowers or hops and then ferment it. 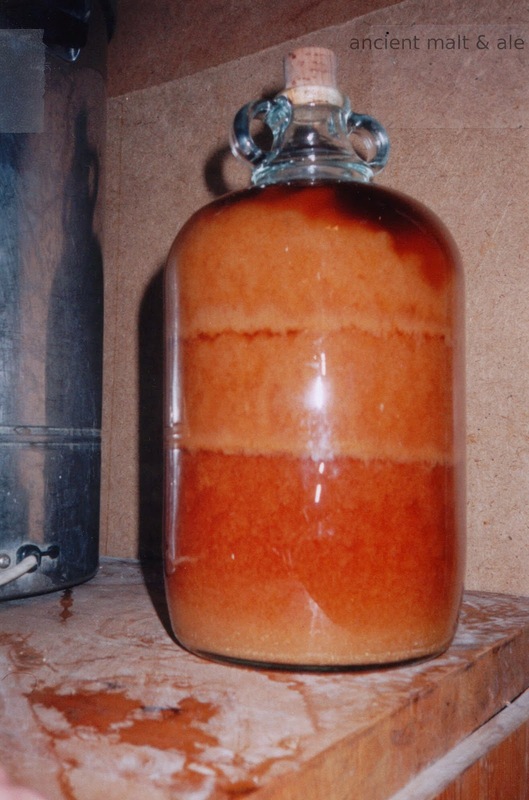 You can use the barm from previous brews to start a fermentation, it is ideal. A simple process, once you know how to do it. The second type of brewing residue is cereal based, but with traces of yeast and herbs, hops, flower heads, leaves, twigs or pollen that settle out during the fermentation of the wort in the fermenting vessel. If you are lucky enough to drink a bottle of traditionally made real ale, the kind that must be poured in one go so as not to disturb the sediment, then you will know roughly what I mean. Let's go back to the Balfarg excavation report. The pots in question were numbers 63 and 64. Sherds from these two large grooved ware bucket shaped pots were found in a pit, close by one of the rectangular timber structures. Brian Moffat's descriptions of the cereal based residues make interesting reading for any all-grain brewer or archaeologist. I recognised immediately what these residues represented when I read them, way back on that summer's day in 1997. Not a sort of porridge with added herbs. Not a kind of gruel. These cereal based residues were probably the remains of brewing sediments from the fermentation bucket. I was so excited by this! Ale in the Neolithic! I ran round to my best friend's house, just round the corner from where I lived, and told her all about it. She is a biochemist and was just as excited as I was. I told my supervisor the next day. He did not seem impressed at the prospect of malt and ale in neolithic Scotland. The previous year I had a short article published in British Archaeology, so I contacted the editor. He asked me to send him some details so that he could include it in the News section, September 1997. The Getafix and magic potions reference was not my idea! I do like it, though. these two types were abundant in all samples. both barley & oats, part grains, there was no entire carbonized grain since the grain had been thoroughly ground down, making taxonomic identification difficult. "... a cereal based preparation ... with meadowsweet, indicated by both pollen & macroplant remains, clumps in one sample indicate a flowerhead was added ... fat hen ... cabbage/mustard? ... the single record of nightshade is puzzling ... pollen from hemlock ... the mix is coarse and crude ... like course porridge with potherbs and flavourings"
Another burned deposit was encrusted on the outer surface of one sherd of Pot P63. Both pollen and seeds of black henbane were identified. "... the seeds are robust and resilient and the breaks show mechanical rendering ... pollen and seed fragments were fairly well intermixed suggesting an incomplete process of homogenization ... the small cache of seeds is of black henbane alone." Two separate organic residue deposits. One inside the pots, this one was cereal based with several different herbs added. The other residue was a burnt encrustation on the outside surface which, when first analysed, contained henbane pollen and several henbane seeds. The above photo is from the booklet "Balfarg. The Prehistoric Ceremonial Complex" published by Fife Council, Glenrothes Development Corporation and Historic Scotland, 1993. I think it was intended as a guidebook for the site and is now out of print. There may be secondhand copies available. The original archaeobotanical report of the Balfarg residues is on pages 108-110 in Proceedings of the Society of Antiquaries of Scotland, Vol 123. According to Culpepper, henbane should never be taken internally. More modern herbal reference books warn that it is a deadly poisonous plant. Do not use. This is very good advice. 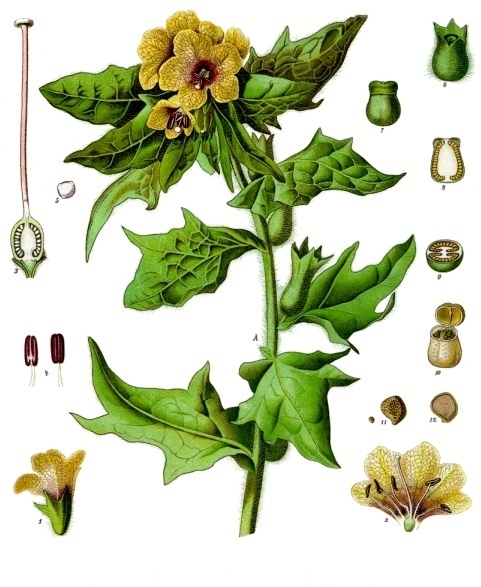 However, henbane does have its' place as a herbal remedy that was sometimes used in historical times, for example, to alleviate earache if applied externally, as a tincture. If consumed in small quantities, henbane induces intoxication, hallucinations, blurred vision, rapid heartbeat, euphoria and dizziness. It is an effective painkiller, according to the herbal literature. All parts of the plant can be used and the seeds are about ten times more potent than the leaves or flowers. I am sure that, in the Neolithic, people knew about the medicinal and other properties of the henbane plant. It grows well in coastal regions and henbane seeds were identified at Skara Brae, a neolithic village in Orkney, Scotland. An intriguing aspect of the plant is that the active ingredients, the alkaloids, are more soluble in alcohol than in water. This appeared to be not about the cereal based residues, but rather about the unusual identification of henbane seeds in the burnt encrustation on the outside surface of a neolithic pot sherd. It seems that, at first, there was not a problem. The excavation report, with its' rather interesting archaeobotanical report, sat quietly in the library journal section for a few years. It did not make any trouble. As more things were written about it, and as more archaeologists made reference to the possible "ritually charged" aspects of this rare residue discovery, it seemed that a re-analysis was required. This was commissioned by Historic Scotland. Two academic papers were rapidly produced. 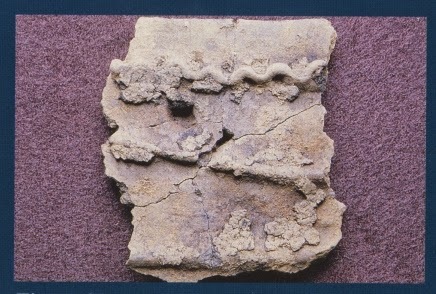 The first was published in January 1999 in the Journal of Archaeological Science. This is a pay to view paper, with access available through University Libraries. Although the existence of henbane seeds within the residue was not confirmed, the residue was described as "a uniform and well processed substance, possibly something like a thick carbohydrate or protein based gruel". This description is consistent with the sludgy residues that accumulate at the bottom of an ale fermentation vessel - a well processed homogeneous mixture of cereal chaff, pollen, plant fragments and seeds. The second paper was published in March, 2000 in Antiquity. This one, happily, is accessible online and is essentially a summary of the first paper. The focus is on disproving the "henbane ale" theory. The abstract makes this clear: "Were drugs in use in prehistory? Recent claims for the use of hallucinogenic substances have been made, and caused a stir. However, new work on a Scottish Neolithic ceremonial site suggests archaeologists (and the media) may have been jumping to the wrong conclusions!" Whether or not henbane was added to the ale is clearly debatable. If such plants were being added to the brew, then it infers an understanding of their properties and some interesting ritual practices in prehistory. It might infer shamanistic practices, witchcraft, medicinal use of plants and more. A paper has been published recently in the Journal of Archaeological Method and Theory by Elisa Guerra-Doce of the Universidad de Valladolid in Spain. She argues that "far from being consumed for hedonistic purposes, drug plants and alcoholic drinks had a sacred role among prehistoric societies. It is not surprising that most of the evidence derives from both elite burials and restricted ceremonial sites, suggesting the possibility that the consumption of mind-altering products was socially controlled in prehistoric Europe." "Grooved ware comes in many sizes, some vessels are extremely large, about 30 gallons, and would be suitable for fermentation. The majority are smaller, ranging from jug to cup size, and could be used for serving and drinking. The theory that the first British farmers (c4000 BC) had the knowledge and ability to make ale from their crops with their pottery appears to be controversial and not yet widely discussed by the archaeological community." There have been some amazing recent archaeological excavations and discoveries of ancient ceremonial and feasting sites, for example the Ness of Brodgar on Orkney and Durrington Walls, near Stonehenge in England, which was investigated by the Stonehenge Riverside Project. There is also evidence for beer brewing and feasting at Gobekli Tepe in Turkey, at the dawn of agriculture, some twelve thousand years ago. It is surely time for the academic community to start talking seriously about how grain was being processed in prehistory. What were they were using it for? The options seem to be flour, bread, porridge, gruel or malt and ale, with added herbs. Balfarg was excavated before the construction of a housing estate. As a result, plans were altered to preserve the stones and build the houses around them. The excavation reports are online, thanks to the Archaeology Data Service, York University, so you can read it for yourself from the comfort of your own desk or armchair: Barclay, G J & Russell-White, C J (eds) 1993 'Excavations in the ceremonial complex at Balfarg/Balbirnie, Glenrothes, Fife' Proceedings of the Society of Antiquaries of Scotland Vol 123, 43-210. Balfarg had been excavated earlier, in the 1970s. During those excavations a cist burial was found, containing the bones of an adult together with a dagger and a fine beaker with a handle - a rare find indeed. This excavation, by Roger Mercer, was published in 1981: The excavation of a late neolithic henge-type enclosure at Balfarg, Markinch, Fife, Scotland 1977-1978. Proceedings of the Society of the Antiquaries of Scotland Vol 111, 63-171.